Much like 300 or Pacific Rim, The Great Wall is pure style over substance. The film’s soul purpose is to look awesome and, more often than not, it succeeds. That’s not to say there’s no attempt at character development. Honestly, though, the movie is at its best when the characters stop talking and start killing monsters. Granted, it clearly isn’t for everyone. If you’re looking for deep themes or a plot that makes any sense, look elsewhere. While you could argue whether or not it’s technically a good movie, The Great Wall is still an entertaining mess, assuming you’re in the right frame of mind. 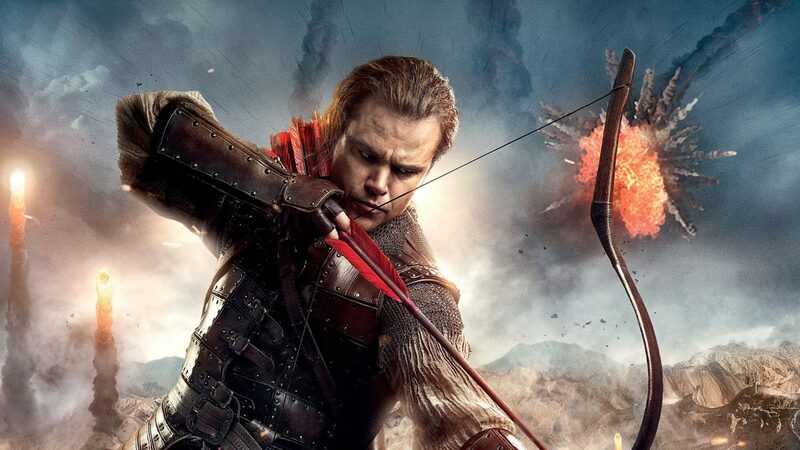 While you could argue whether or not it’s technically a good movie, The Great Wall is still an entertaining mess, assuming you’re in the right frame of mind. The film takes place in Ancient China, which naturally means our protagonist is a Caucasian mercenary named William Garin (Matt Damon). Although Damon sports a pretty hokey European accent, he does manage to have a lot of fun in the role. Along with his companion Tovar (Pedro Pascal), William is captured and taken to the Great Wall. There, he meets an assortment of Chinese soldiers, including Jing Tian as Commander Lin Mae. These soldiers make up a secret military group known as the Nameless Order. For a secret army, though, the Nameless Order isn’t exactly subtle. Heck, they wear multicolored suits of armor that look like the uniforms from the new Power Rangers movie. As if China didn’t have enough enemies already, the Great Wall is suddenly attacked by a horde of mysterious monsters. Where exactly did these monsters come from? What do they want? Why is Willem Dafoe in this movie? Eh… none of that’s really important. What does matter is that William’s the only one who can lead the Nameless Order to victory. So yeah, it’s a pretty by the numbers white savior story that would be mostly forgettable if it weren’t for the spectacular visuals. With that said, the visuals here are pretty spectacular! So yeah, it’s a pretty by the numbers white savior story that would be mostly forgettable if it weren’t for the spectacular visuals. The film comes from director Zhang Yimou, who previously made Hero, House of Flying Daggers, and Curse of the Golden Flower. As we’ve come to expect from Yimou, the production design, stunts, and choreography here are nothing short of astounding. Some of the CGI can get a little obvious, but Yimou balances that out with plenty of practical effects. Even the colorful costumes, as silly as they look, are quite pleasant on the eyes. If anything, they help the action sequences stand out even more, which is especially welcome in a 3D movie. For the most part, the set pieces are insanely creative and vivid. The only one that’s sadly a disappointment is the final battle, which isn’t nearly as over-the-top as one might hope. Yimou basically just rips off World War Z as a tidal wave of monsters climb up a tower. The film then rushes to its ending with a deus ex machine. It’s a rather lame way to close out an otherwise cool flick. If you get your fill of eye candy in the first two thirds, however, you’ll likely walk away satisfied nonetheless. This entry was posted in Reviews and tagged Action, Adventure, Fantasy on February 17, 2017 by Nick Spake.